Seattle has struggled to get thousands of people living in their vehicles into housing. How have programs in San Diego and Santa Barbara managed to be more successful, and cost effective? 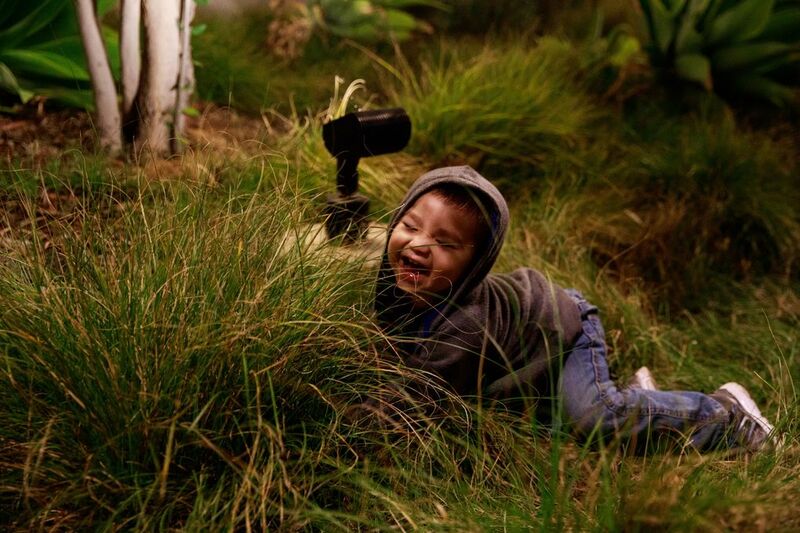 SAN DIEGO — Standing near a row of blooming lemon trees, Ester Cruz and Richard Stanich watched their 2-year-old son race his plastic, giraffe-shaped tricycle through the parking lot as he tried to keep up with bigger boys on bikes. Nearby, a woman walked her dog and another sat in a lawn chair, smoking a cigarette. 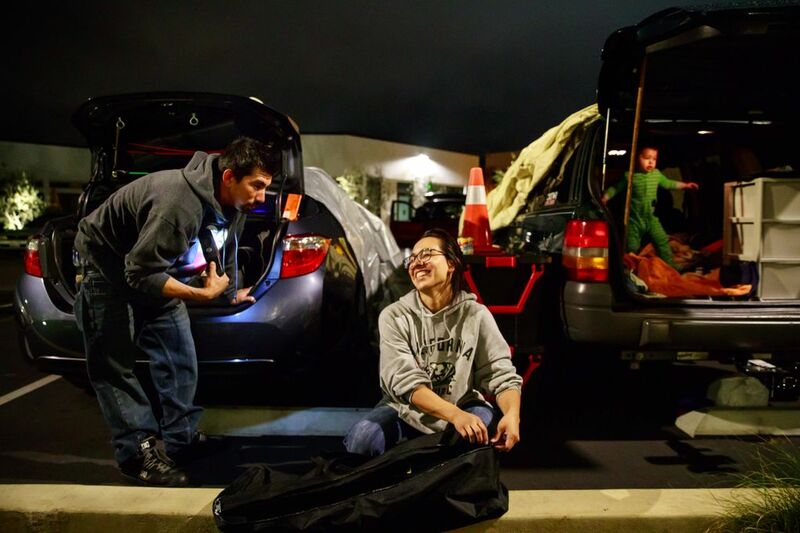 The scene had the trappings of a spring night in a typical Southern California neighborhood, but it belied what it really was: a fenced parking lot for people like Stanich and Cruz, an Uber driver and a Starbucks barista, who work but can only afford to live in their vehicles. Like Seattle and other cities up and down the West Coast, where home prices and rents are soaring, San Diego is experiencing a growing homelessness crisis. 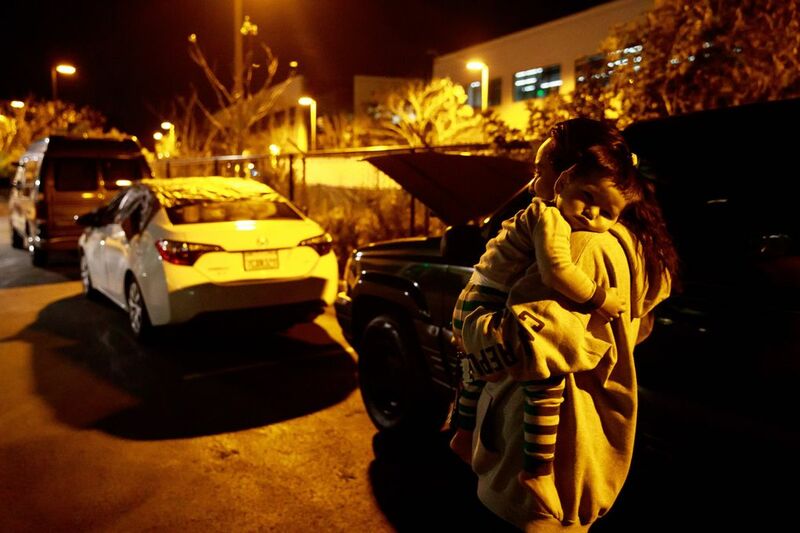 And like Seattle and King County, one-fifth of San Diego County’s homeless population lives in their vehicles. But San Diego has managed to do something Seattle hasn’t: sustain a large, longterm effort that consistently gets people out of their vehicles and into housing. On average, San Diego has gotten 43 percent of clients like Cruz and Stanich into housing every year. 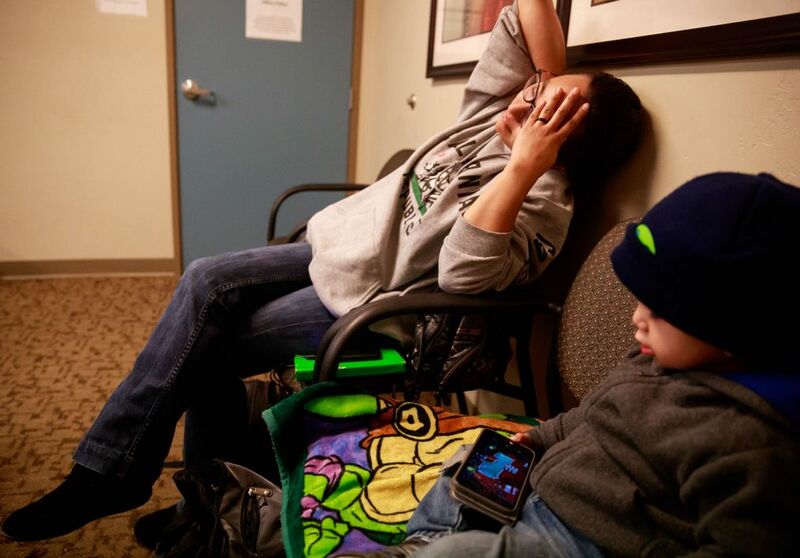 In Seattle, at the peak of its faltering program, just over one in 10 got housed. And San Diego does so far more efficiently, spending $436,000 to operate three safe lots with a total capacity for up to 150 vehicles, while Seattle was on track to spend nearly that much in a year on a single parking lot, for just 20 vehicles. The success of San Diego’s program, run by the nonprofit Dreams for Change, may largely stem from what the program doesn’t do. It does not allow people living in RVs. It only allows people in at night. And until recently, most of the clients were experiencing homelessness for the first time. Seattle’s safe-lot program, in various incarnations, has not made those hard choices. In the current version, which the city of Seattle has dubbed a “safe zone,” the residents live in a pothole-filled unfenced lot in the Sodo industrial district. 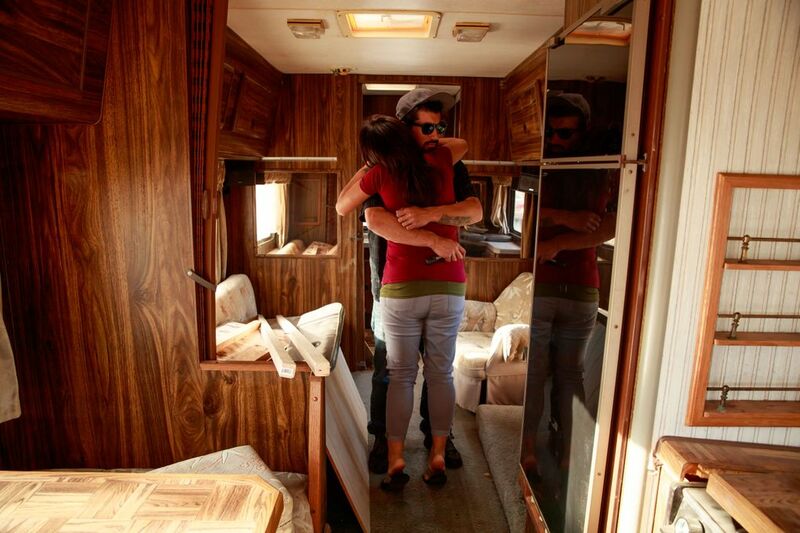 They all live in RVs that never have to move, and are all chronically homeless. Three safe- zone residents recently died, two of them in their vehicles. 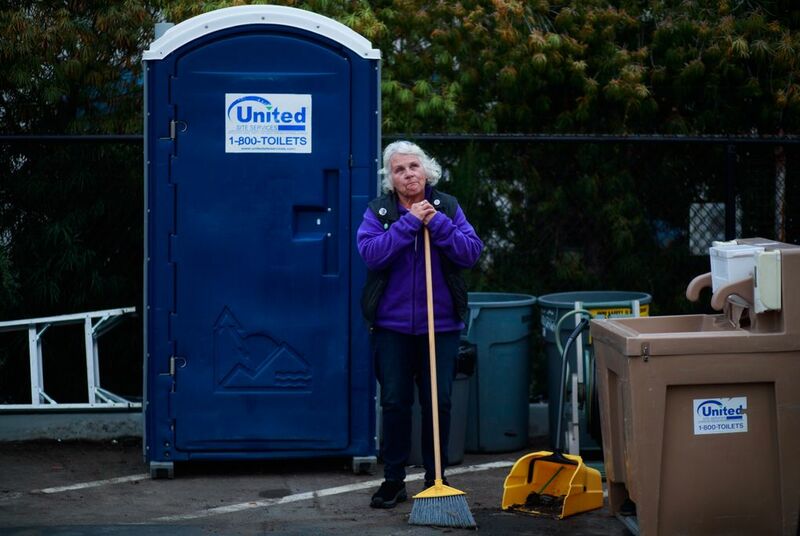 In Seattle, a case worker visits once a week; in San Diego, case workers are there every night. Seattle’s program previously operated with more spaces and far more regular casework, so more clients found housing. But so far this year, only one person from the lot has been housed. Replicating the San Diego program in Seattle could be a challenge because it is not illegal to live in one’s vehicle in Seattle. It is in San Diego — one likely factor that drives people into the Dreams for Change program. 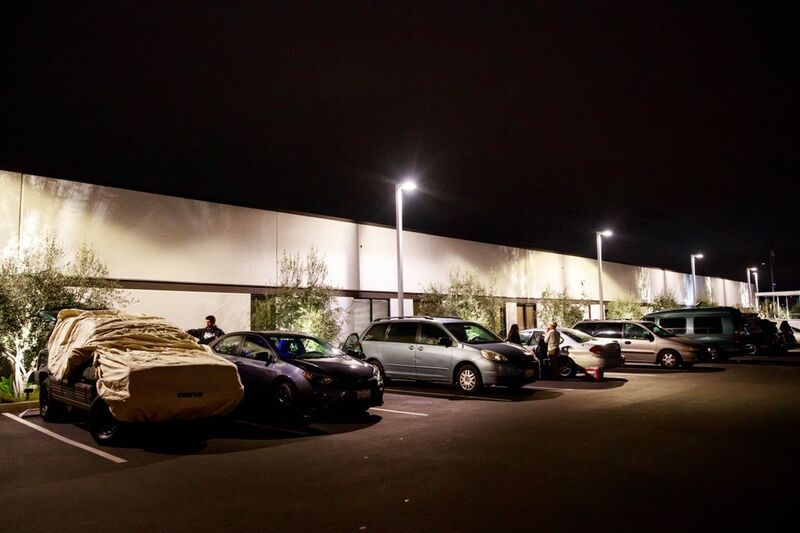 And while Seattle’s safe-lot program is on its last legs, San Diego’s program now provides a safe place to sleep for more than 200 people every night, with a long waiting list for spots. It was 2010, in the wake of the Great Recession, when Teresa Smith noticed more and more of her clients at a San Diego nonprofit were becoming homeless for the first time. They preferred living in their cars rather than shelters, but there were no designated parking spaces where they could go. 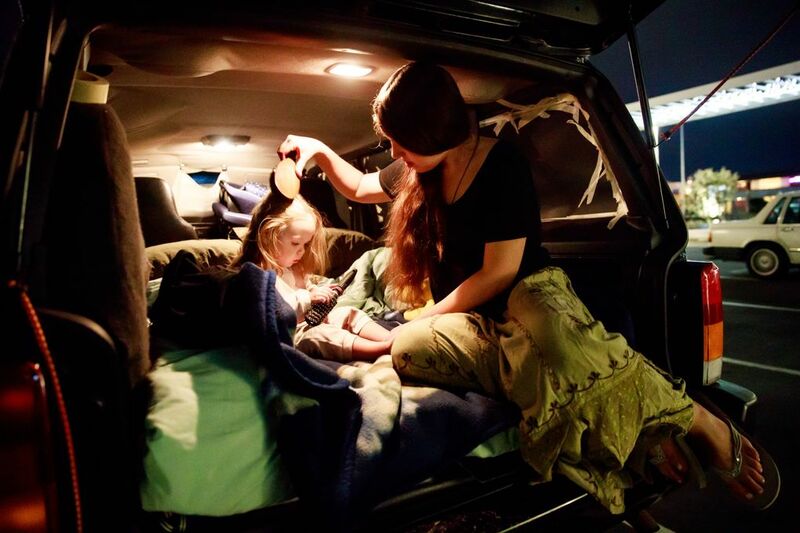 So she created a new nonprofit, Dreams for Change, to deliver services to a large number of vehicle campers while fostering a sense of community. The program started small, gradually growing, until it doubled in size last fall after receiving money from the city of San Diego for the first time. The funding followed a hepatitis A outbreak in California that killed at least 20, most of them living outside and not in vehicles. Dreams for Change’s clients may not have been affected by the outbreak, but the program does a good job of helping people who are in an “interim stage” of homelessness and who fear losing their cars because of too many parking tickets, said Ray Ellis, a San Diego business leader and a member of the region’s homelessness task force. Dreams for Change now operates three fenced, gated lots, two with 60 parking spaces and one with 30. Case managers are on site at all three locations for several hours every night. Clients stay in the program an average of 157 days, a little more than five months. Families in the program are assigned to a lot on the property of Jewish Family Service (JFS) of San Diego. They can begin arriving around 6 p.m., after JFS employees leave for the day. As of late March, about 70 adults and 33 children stayed there. It is a mishmash of people from different circumstances — retirees, teenagers, young families. Clients have to pitch in on chores. The program doesn’t allow alcohol or drug consumption on site. 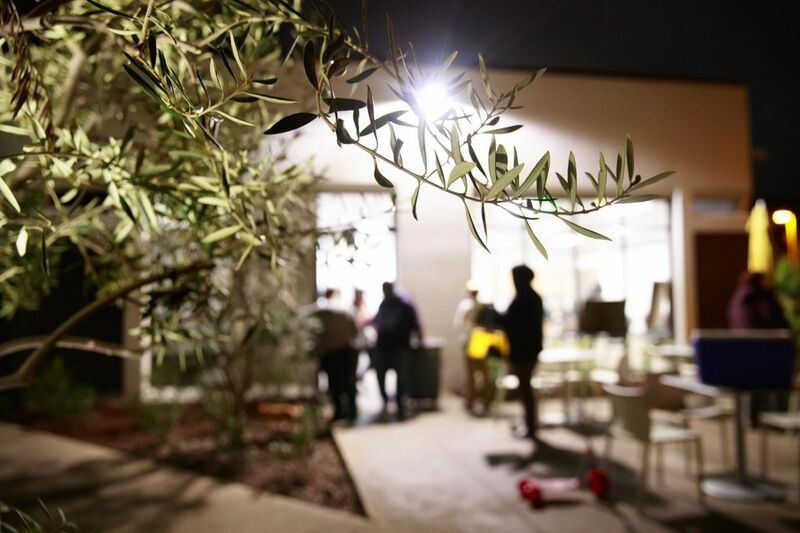 At the JFS lot, there is a patio off a community room that clients can use for a few hours every night to eat meals, congregate or meet with their case managers. The addition of city dollars means there are now housing specialists on site. 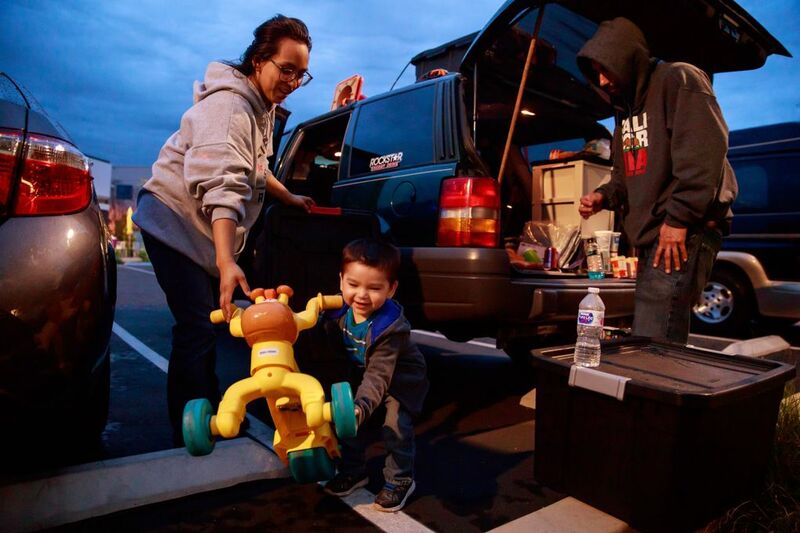 Cruz, 30, and Stanich, 29, moved into the safe lot program in mid-March, the same month average rents in San Diego hit an all-time high of $1,887 a month, roughly equal to rents in Seattle’s Ballard neighborhood. Even with their jobs, the couple still can’t afford an apartment here. Both from San Diego, they briefly lived in a relative’s garage, sleeping on an air mattress, until neighbors complained. Then Cruz’s boss at Starbucks told her about Dreams for Change. On a recent evening, Cruz changed her toddler son’s diaper in the back of the couple’s Jeep Grand Cherokee, which she has dubbed the “She Hulk,” while Stanich polished their second car, a Toyota Corolla, preparing for a night driving for Uber. He fastidiously keeps their vehicles and the space around them clean. 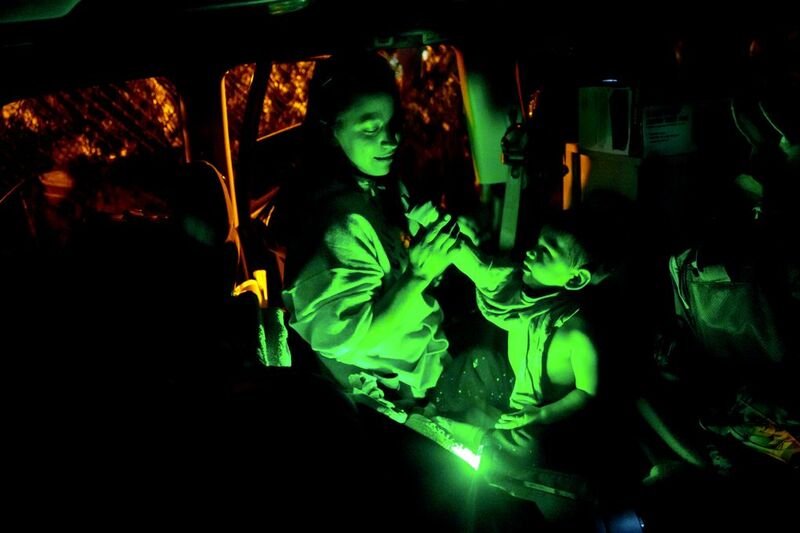 She nursed her son to sleep by the harsh green glow of a portable light. “He doesn’t exactly know what’s going on,” Cruz said. She had to get up in a few hours for a 6:15 a.m. shift at Starbucks. Instead of getting ready for work in a bathroom, she does her makeup by the light of the car’s visor mirror, while her toddler sleeps to lullabies she plays on her smartphone. Cruz and her husband see each other briefly in the mornings when they hand off their boy, so Stanich can take him to child care. 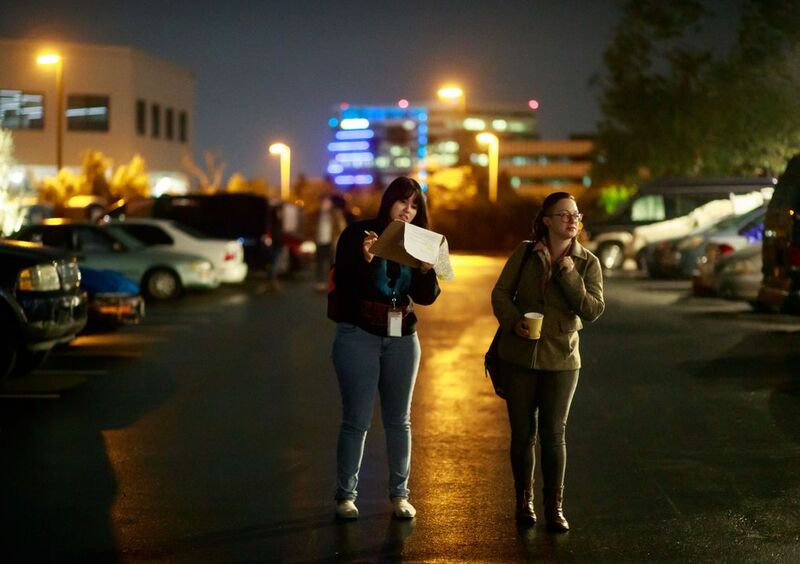 By 10 p.m., the lot was mostly quiet, because clients can’t run their vehicles at night. Soon, the only sign of activity was the glow of cellphone screens through the vehicle windows. 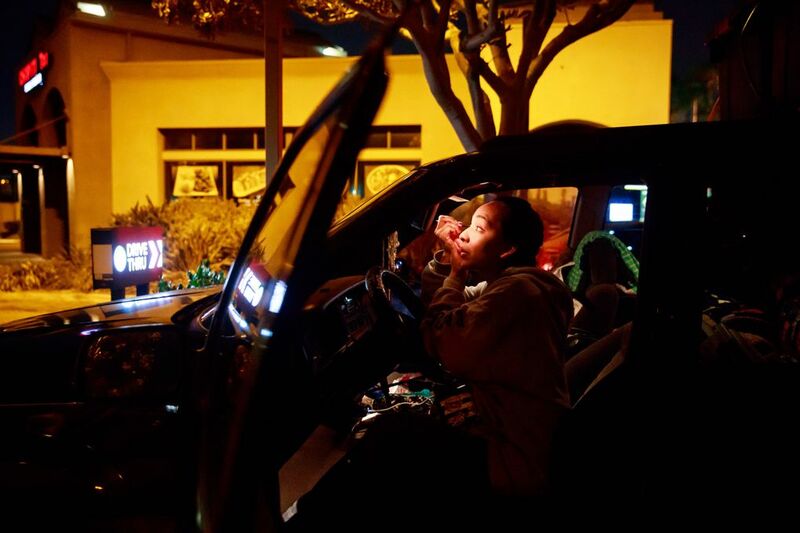 More than 200 miles up the Pacific Coast, in a city so opulent it’s often known as the American Riviera, Santa Barbara takes a very different approach from San Diego to homeless vehicle camping, but still has had better results than Seattle. A high of 22 percent of clients made it into housing in 2016, but as few as 13.6 percent the year before. People bed down for the night in two dozen vehicle lots scattered across Santa Barbara like wedding rice. The program has been around since 2004 and is considered one of the longest-running in the country. Most of the clients are seniors or working adults and, as in San Diego, the program is overnight only. Unlike in San Diego or Seattle, Santa Barbara’s two dozen lots are micro-sized — typically five to 10 spots. The model slightly resembles an idea floated by Seattle Councilmember Mike O’Brien last year, to create 40 to 50 small safe parking zones across the city. He also proposed that people in the program could be exempt from certain parking laws. Santa Barbara offers no such leniency. Although there is a strong philanthropic spirit in Santa Barbara, there’s also a strong “not-in-my-backyard” mentality, said Cassie Roach, program coordinator for New Beginnings Counseling Center, the nonprofit that runs the safe-lot program. So the lots are designed to draw little attention. They are tucked into wealthy neighborhoods, near historic sites, in downtown and by the beach. All the locations are confidential. Each lot in the program belongs to a different property owner, both private and public, including some city and county properties. Each lot owner dictates what type of vehicle they will allow, and how many. The Santa Barbara Home Improvement Center, a local hardware store, sets aside one of its 87 parking spaces for the vehicle camping program and has not had problems, said Michael Owens, the store operations manager. “It just seems like an easy way to try to help somebody who is struggling,” Owens said. Once in the lots for the night, clients aren’t supposed to talk to the property owners or linger outside the vehicles. There are no lawn chairs set near lemon trees, as there are in the San Diego program. By 7 a.m. in the San Diego lots, every one of the Dreams for Change cars will be gone. Much like Santa Barbara, the program is designed to ensure people don’t linger during the day because that’s not good for their mental health, said Smith, the CEO. “The best way to help them along is to say, you can’t stay here,” Smith said. But that puts many clients in a difficult position, especially if they don’t have a job or somewhere else to go. Some clients hang out at the beach or a nearby park. One mother and her 14-year-old son go to the public library after he’s done with school, waiting for the safe lot to open. 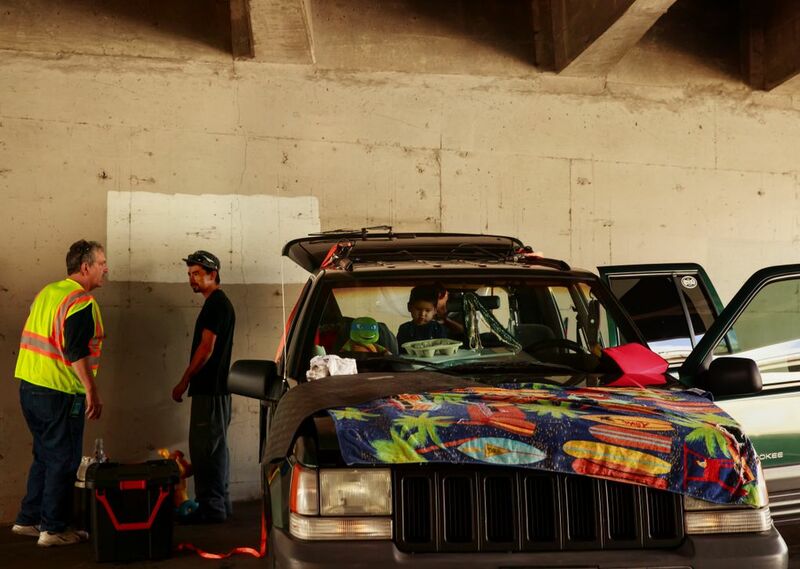 One recent morning, Cruz and Stanich met under a busy highway to organize their possessions, camping gear, toys and essentials. Their son played amid the chaos, driving his tricycle between the two parked vehicles as cars and trucks roared overhead. A California Department of Transportation worker pulled up. This was state right of way, he told them. The previous day, Stanich had his wisdom teeth pulled. The oral surgeon let him recover in the office while Cruz drove around with her son, picking up his prescriptions. But after that, Stanich had to recover in his car. Lack of sleep was catching up to both of them. “It’s just living day to day,” said Cruz, her normally upbeat personality subdued by fatigue. Tiring of life in small vehicles, the couple decided to buy an RV from a friend of a relative for $1,000, even though it had mold inside and a persistent smell of gasoline. Stanich was convinced he could make it work. “I feel like I’m gonna have a roof over my family’s head,” said Stanich, after they picked up the RV and made their first payment. “It’s a bigger roof than this one,” said a smiling, elated Cruz. However, choosing to live in the RV would mean leaving Dreams for Change. This points to a hole in the organization’s model: The program doesn’t accept RVs or campers. 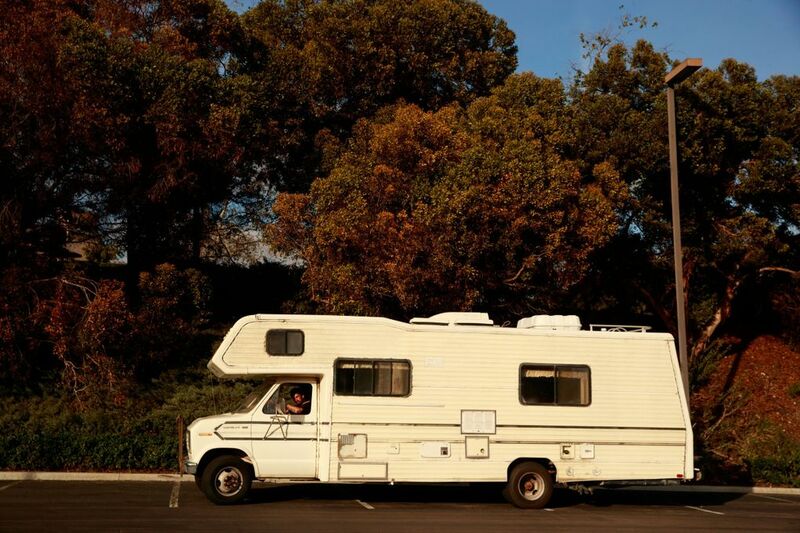 That puts RV dwellers in a vise — RVs are also banned from parking on any public street in San Diego from 2 a.m. to 6 a.m. In Santa Barbara, RVs can’t park on a city street at all. That prompted New Beginnings to open five day lots for RVs, but that’s only 16 spots. On this issue, Seattle is more lenient. RVs can park in industrial areas for up to 72 hours, but there is no law banning them from the city streets outright. That’s caused tension with residents and businesses in industrial areas like Ballard, Interbay and Sodo, who say RVs are bringing trash and crime into their neighborhoods. Smith, with Dreams for Change, said the San Diego program doesn’t allow RVs because a different population lives in them, people generally more resistant to leaving their vehicles for housing. That creates a cat-and-mouse game between RV residents and police, said Ann Menasche, a San Diego attorney who last year filed a class-action lawsuit against the city’s RV ordinance and a law banning people from living in their vehicles, arguing they unfairly target vehicle residents who are disabled. People try to avoid police, “but they get caught all the time,” Menasche said. 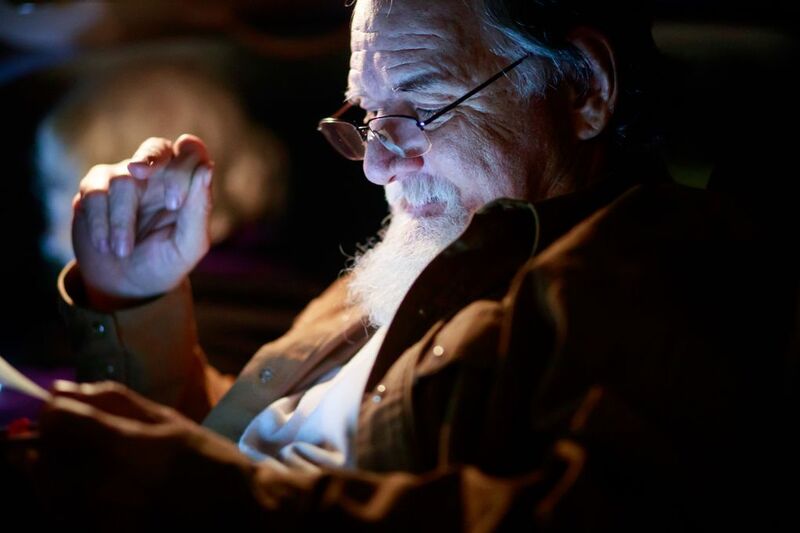 A month after Cruz and Stanich bought the RV, Cruz was still living in the Dreams for Change lot. Stanich had been working on the RV but wasn’t finished; the water damage inside was more extensive than they had originally noticed. He moved it every couple of days to avoid trouble with police. The frustration and stress of their living situation and opposite schedules caused tension, so the couple decided to take a break from the relationship. That’s not uncommon, a Dreams for Change caseworker said, for families living in a difficult situation like this. Cruz agreed. “You can’t fix a relationship when you’re out on the streets or living in a car, living in a motor home, trying to fix it and trying to make sure you make a home for the family,” she said. 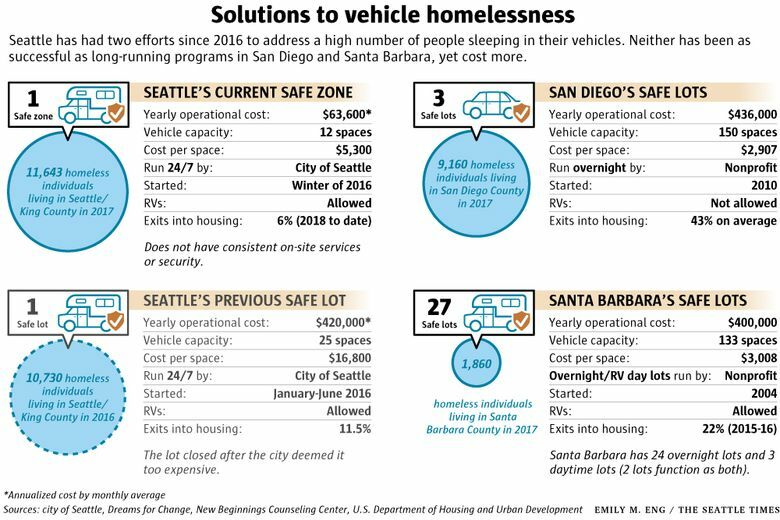 Seattle’s strategy to address vehicular homelessness remains up in the air. Mayor Jenny Durkan recently announced modest new efforts but has released no comprehensive plan. The Seattle City Council will soon decide whether to tax the city’s largest employers to fund more affordable-housing and homelessness services. Included in the proposal — which is still subject to change — is money for 97 parking spaces for vehicle campers, scattered in a dozen or more lots across the city. Unlike in San Diego, the council’s proposal would allow RVs and would operate 24/7. And it would cost more than double San Diego’s program — roughly $1.15 million a year, or nearly $12,000 per vehicle in the program. Most of that money would go to case management. In San Diego, Dreams for Change is experiencing its own growing pains. The new city funding allowed the program to grow, but it also has resulted in more chronically homeless and harder-to-serve clients — the kind of clients that Seattle’s safe-lot program started with. As a result, Smith, the CEO, expects the program’s success rate getting people into housing will drop. Cruz recently set up an appointment with a Dreams for Change housing specialist, hoping to rent a single room and gain more stability for her growing, energetic son. She and Stanich remain grateful for the RV, even if it’s parked elsewhere, because at least their toddler has a bed to sleep in occasionally now that Stanich has thoroughly cleaned the interior and removed the mold. But Cruz and her son still sleep in the parking lot most nights. And Cruz has found a kind of community in the people here who, like her, want more for themselves and their children. Even then, sometimes at night, the pain catches up to her.